Valentine’s Day this year was like none other. Travelling in a taxi, my boyfriend gave me an envelope which held the secret treat he’d been planning for months; 24 hours in Amsterdam. 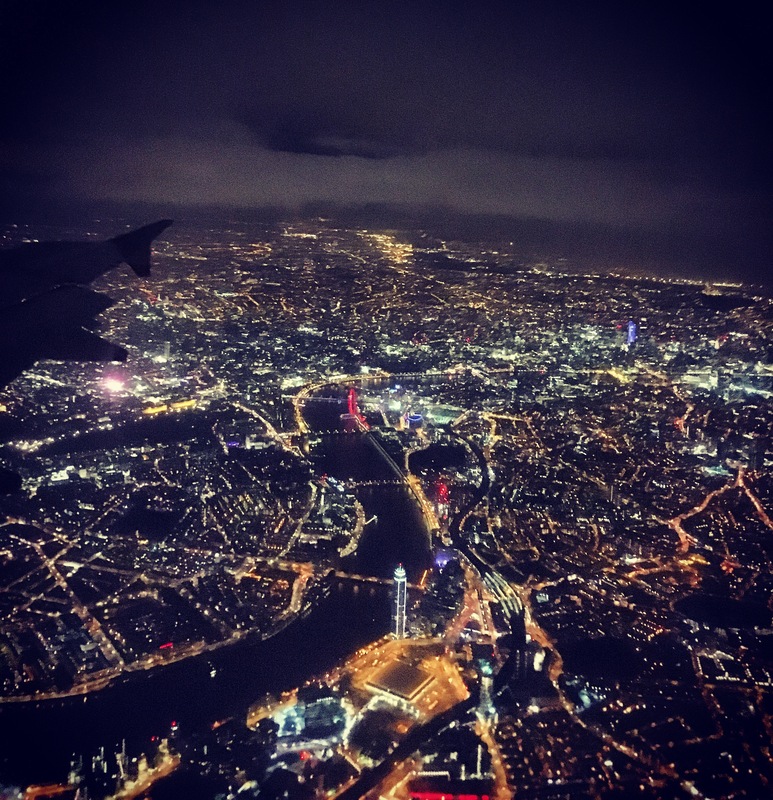 Although I had been twice before, he hadn’t and with it only being an hour away on a flight we drove to the British Airways Terminal 5 beaming with excitement. 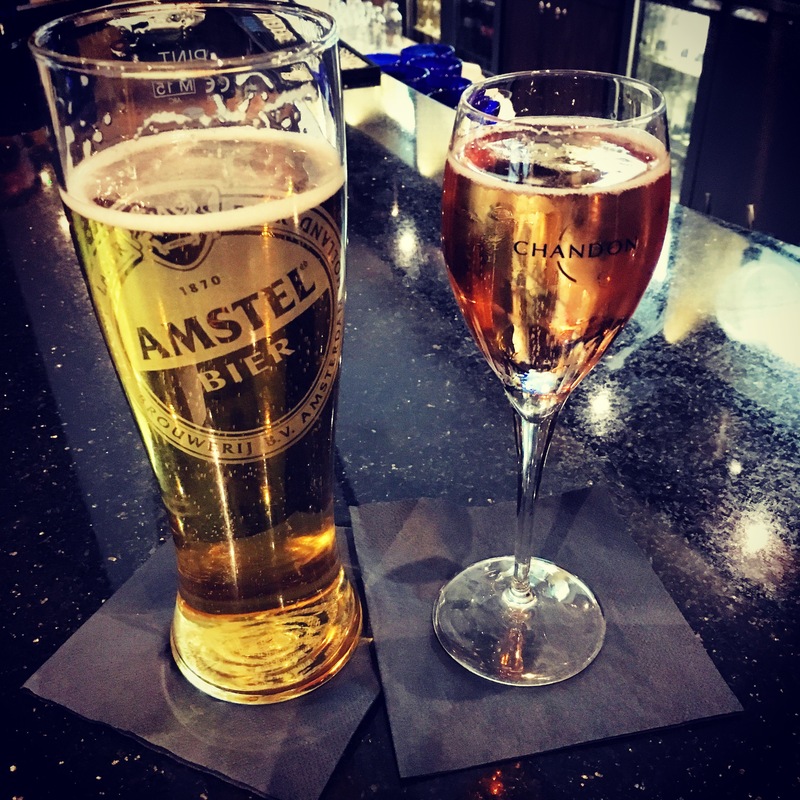 After we checked in, we instantly looked for somewhere other than wetherspoon’s to have a glass of champagne. After finding a suitably nice bar to sit at, I sipped away at my Rosé Moët & Chandon and tried not to pinch myself. After a slight technical fault on the plane which was fixed speedily, we whizzed across to Dam and were picked up by a blacked out taxi which took us the 20 minutes to our destination. Arriving at Hotel Estherea, located on the the singel, Amsterdam’s oldest major canal, I felt like we had stepped back in time. 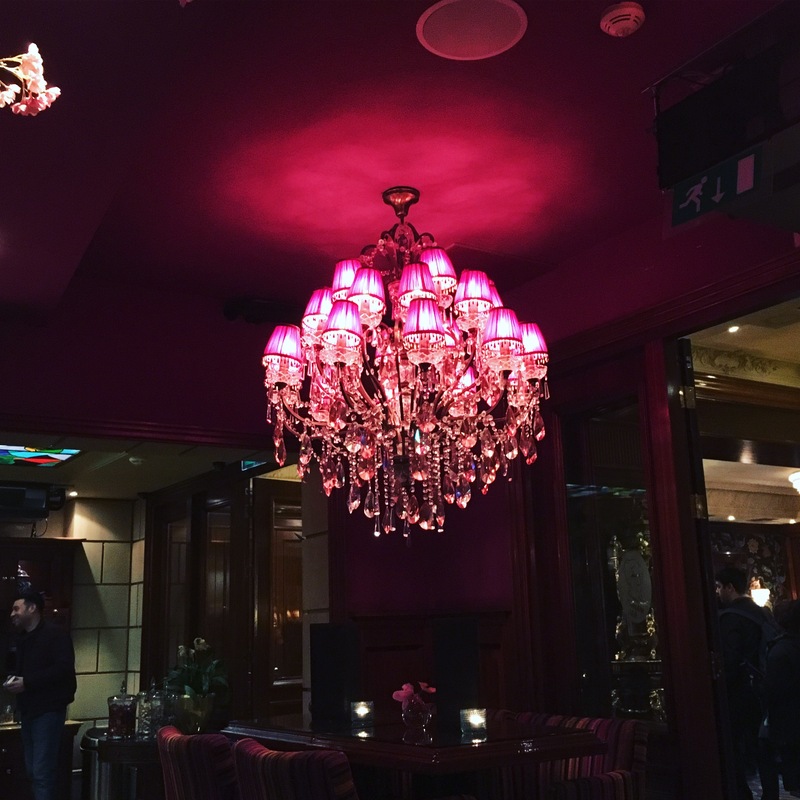 A family led establishment of three generations, the rich pink decor, big chandeliers and larger than life fabrics all complemented each other in the most perfect way. Our room was kitsch, cute and stocked head to toe with l’occitane goodies which is the way to my heart. As we arrived at 9pm we headed straight down to the hotel cocktail bar. The overtly pink atmosphere was romantic, the margarita I enjoyed deliciously bitter sweet and the excitement palpable for the rest of our trip. 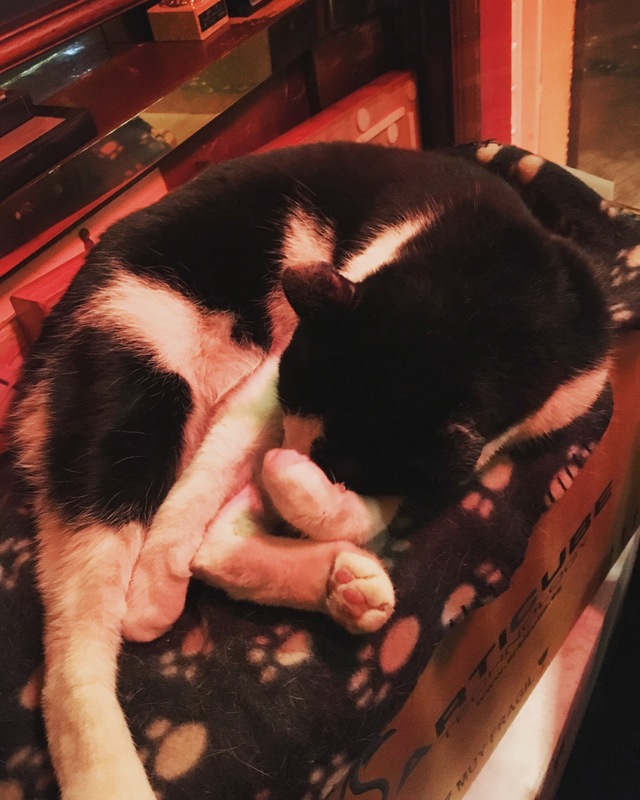 We walked towards the city centre and ended up in a bar which had the cutest cat curled up by the window. 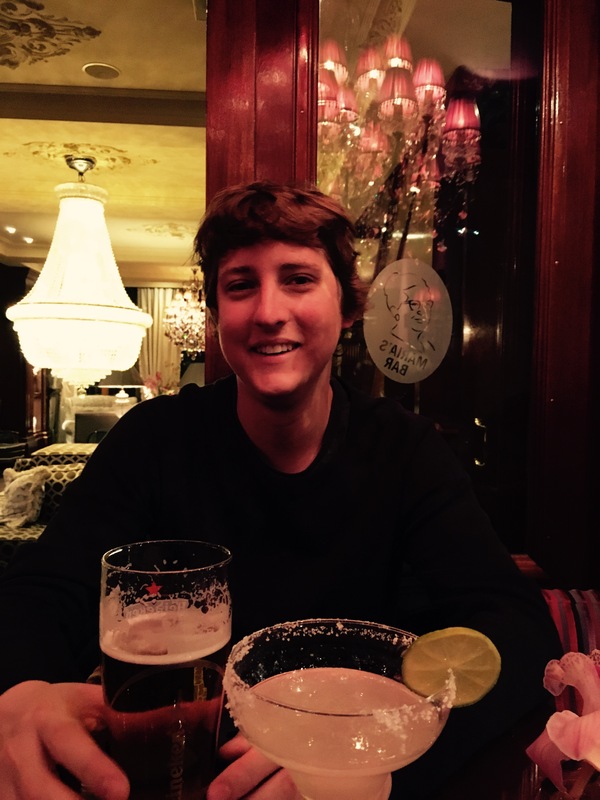 I ordered yet another margarita – which was probably the worst I’ve had but hey I was in Amsterdam! The music was Frank Sinatra on repeat, with images of him plastered on the walls, we sat by the window and watched the rain fall – a bit unusual when you have a Mexican icy drink in your hand but when in Rome (Dam). 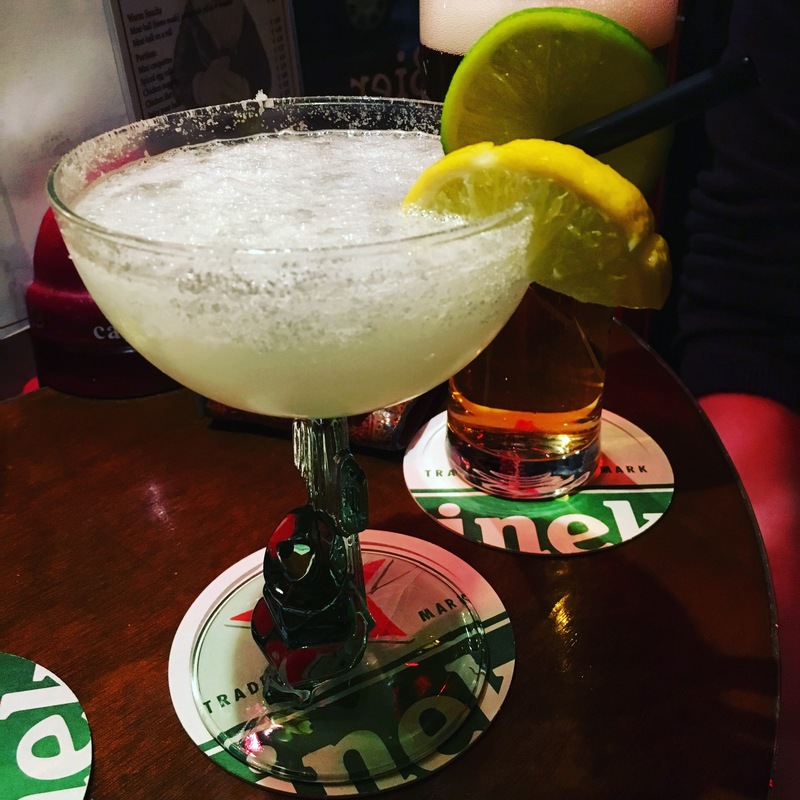 Resisting another awful margarita, Charlie and I walked into the bustling streets of Amsterdam. We passed drunken stag dos, drunken university students and super high tourists. Even though it was raining the atmosphere of the city was buzzing; the neon lights, loud music and clear jovial spirit was all over. The problem with only 24 hours in one place, and with no solid places booked in, is you find yourself being quite indecisive. With the lack of time on your hands you panic that if you go in somewhere it won’t be good – but somehow Charlie had got rid of my worried nature and so I just went with the flow. Walking around and witnessing the consumption of various takeaway foods got Charlie and I rather peckish. Being turned away from Gaucho, we wandered around in the cold and the rain, resisting the various pizza and chip bars. 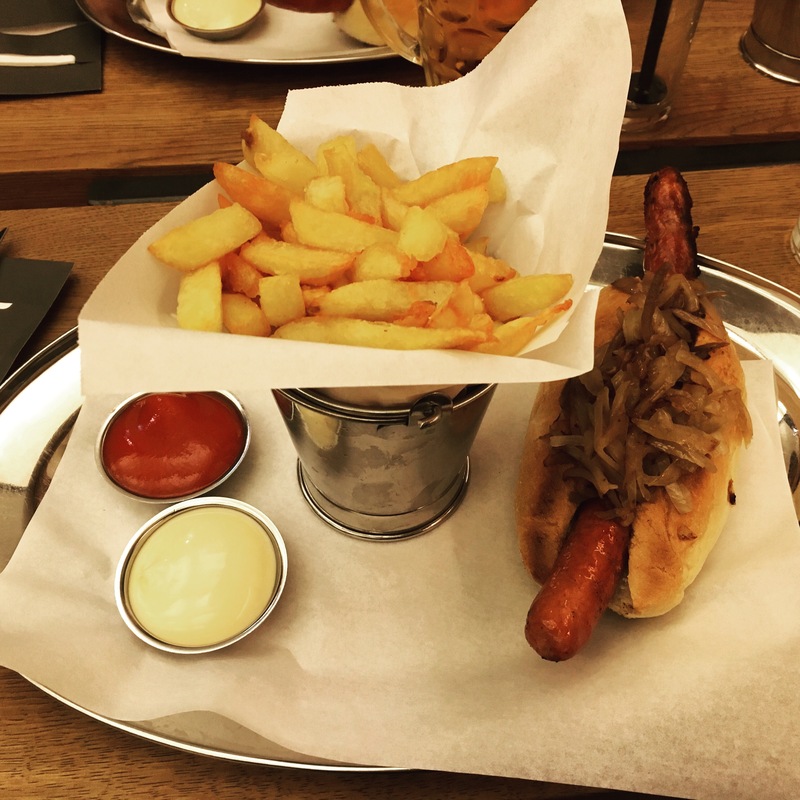 Fortunately we came across a winner, in the name of Burgerfabriek – a burger and hot dog joint, emanating a cool but basic atmosphere with beer taps situated at the end of tables. It was still Charlie’s birthday so if he was happy, so was I – and we went about ordering two hot dogs, mine with a controversial avocado paste and Charlie’s with pulled pork all over it; absolutely delish. Following our very healthy dinner, we walked out straight into the red light district and visited a few bars along the way. Some of the places we found were super cool, where you found Alexander Skaarsgard-esq bartenders serving up delicious views as well as drinks (sorry Charlie). Not wanting to stay out too late, we headed back to our gorgeous hotel around 1am and fell asleep in pure unadulterated bliss. The next morning we awoke as if we had been in a coma, and slowly made our way downstairs to the all you could eat breakfast which was served until 10am (we walked down with 20 minutes to spare…). 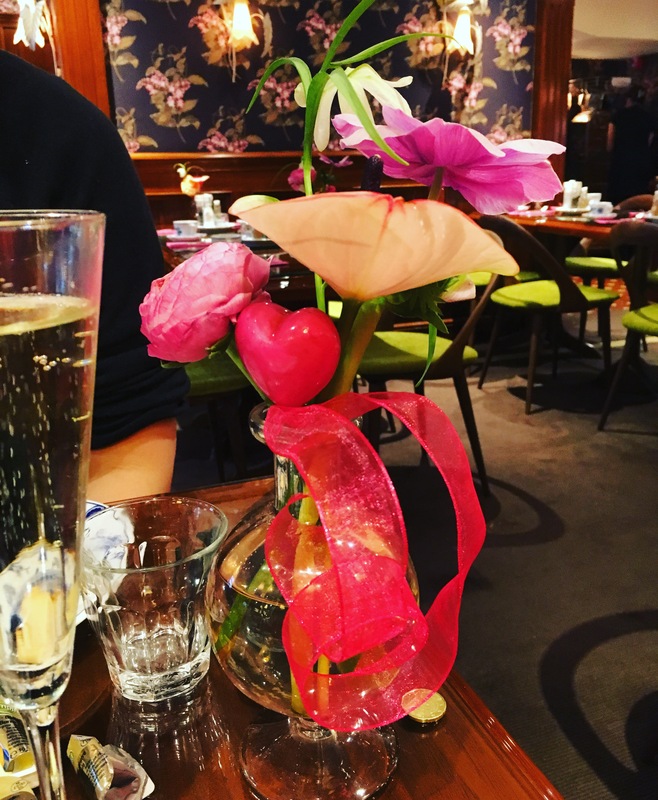 The decor in the room was pink, pink, with more pink plus a little purple splashed in there too – which of course I absolutely adored. There was bottomless prosecco which you could help yourself too, along with different types of milk (coconut, chocolate, almond etc) and juices. I clearly went straight for the prosecco and didn’t really stop. We ate warm baguette bread, beautifully scrambled eggs, smoked salmon, ham, croissants, waffles and fruit. I find when a buffet is in front of me I find it quite difficult to remove myself away from it and so we devoured at least three platefuls each of food. Their eggs have to be the best I’ve eaten in a hotel – and the choice of food available up there too. We regretfully checked out of the hotel, swiftly and without a problem and walked out into a snowing Amsterdam. We went in and out of nameless pubs, one of which I accidentally broke the pool table of, and then decided to try out some icing sugar sprinkled churros which were doughy – fluffy and devilishly naughty. We carried on doing a pub crawl around the city, then ended up at a restaurant called Humphrey’s (we couldn’t not could we?). The lighting was so romantic and dark that no photos would have done justice but the food was absolutely scrummy. I started with garlic infused, chewy escargot (snails for those who may not know), followed by fillet of seabass with lobster sauce, potatoes stewed in tarragon, shallots and green vegetables. Charlie went for carpaccio with pesto and parmesan sprinkled on top, followed by wagyu steak and chips. Neither of us could stomach a desert after our splash out on churros earlier in the day – but left the restaurant was delightfully scrumptious and left us stuffed all the way back to London. Our taxi picked us up from the restaurant at 5pm and whizzed us back across the canals to Schiphol airport where we sadly had to get on the plane and leave our quick fix destination behind. 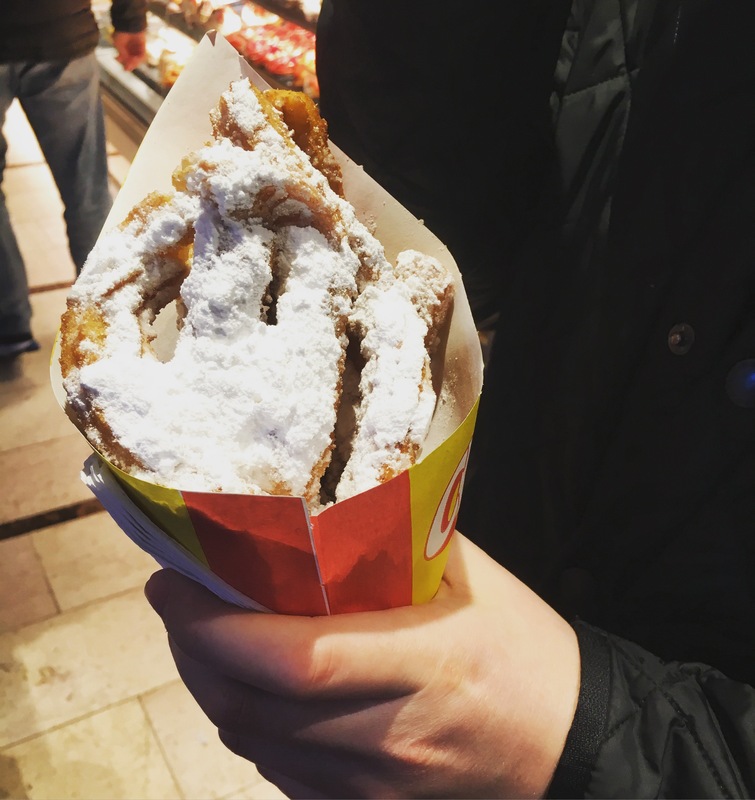 My third time in Amsterdam was not a disappointment – 24 hours in any city is an exciting, pressure-free experience where you can’t feel guilty for missing out on seeing the sights because it’s an impossible task. After what has been a crazy 2016 – my boyfriend made me feel like a rich jet setter just for one night and for that I will always adore him! A month after Valentine’s Day I still very much feel the love.